Hope it made you laff! I have a Ultra Rare Disease called Atypical Hemolyic Uremic Syndrome (a-HUS). Part of my side effects to this disease is painful back and legs among many. I wake up and take a Oxycodene pill and watch t.v. until around 10:00am. Then I get dressed and then I'm up and down the rest of the day. Before I get up, I try to remember to thank the Lord for the day. Then I'm up at 7, instead of 5 when I was working. Clean the cat box, rinse out the cat dishes, make my bed, then back to the kitchen to feed the cats. Then coffee goes on, open front door and luxuriate in the warm sun shining in, before the cats crowd me away from the door. Coffee is ready, so I read a little religious reminder for the day, check to see whats going on in the news, and eat breakfast. After cleaning up the kitchen dash for a shower if it's fun with my grandson day, but if not, time for exercises and a walk. I love the start of the day! A strong dark roast coffee, and Morning Joe on MSNBC. 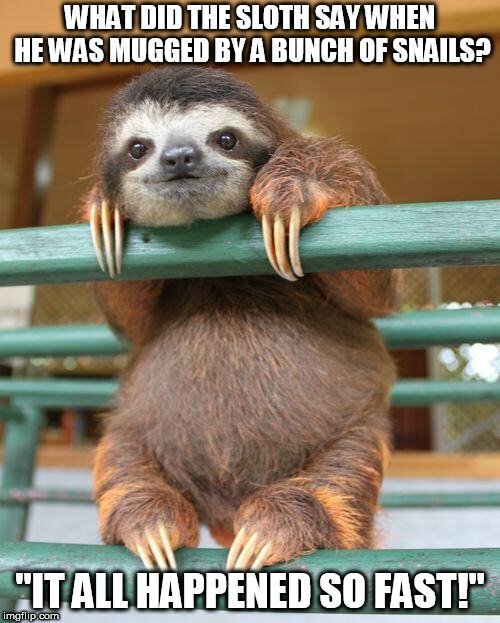 I start my day like a sloth! Our here on our farm we have to get up and get "roaring" in order to feed the dogs, chickens, and goats. Then it's time for us to go for our "run", or walk and pick up recyclables off the side of the road. I've always been a morning person, and even now when I'm retired and soon to celebrate my 80th birthday, I like to get up with the sun (until the time changes again), and go to sleep when it's dark. Between times it's go-go-go! I sleep well and wake up refreshed. By the way, although I've seen (too) many skunks, coyotes, rattlers, and other things on my farm, I've never seen a sloth. I'll keep my eyes open for one! Yes. It looks EXACTLY like that! I'm not exactly sure. I'm up early (usually in the vicinity of 5:00A - have always been an early riser). I dress, turn on the computer and while it's booting make a cup of coffee. Then its on to check my email, play a free online casino game or two, then Pogo Games. By around 8:30 - 9:00, it's housework time based on my schedule which is barely an hour a day and then whatever the rest of the day.